National Machinery Exchange has sold more wire equipment than any other dealer in the world. National Machinery Exchange�s formation came out of a small wire fabrication business. 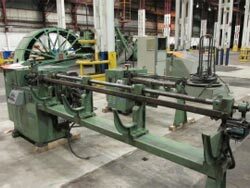 We specialize in wire forming from four-slides, multislides, CNC benders, wire straight and cuts and spring making from mechanical spring coilers, CNC spring coilers, spring grinders, torsion spring coilers and more. We also specialize in wire flattening mills, wire rod mills, Deadblock coilers, bull blocks, and wire mesh lines. Contact us with all your wire machinery needs. Copyright 2013 National Machinery Exchange Incorporated. All Rights Reserved.